These companies are trouncing rivals right now -- and investors can profit from their outperformance. Subscriber numbers are ticking higher in the cable TV industry, but just a few cable stocks stand out from the rest in their ability to get ahead of the shifting media landscape as people devour Internet-delivered entertainment. So today we're spotlighting three companies that are outperforming rivals right now. Whether you're looking for a traditional cable network operator like Comcast (NASDAQ:CMCSA), a TV content specialist like Scripps Networks (NASDAQ:SNI), or a hybrid of the two like Time Warner (NYSE:TWX.DL), there's plenty to like about these cable stocks. With its 1.8% yield, Comcast isn't the best dividend stock in the industry. However, a key reason why income investors have had to settle for a smaller payout is that shares are near all-time highs -- up 150% in the last five years. Comcast's latest quarterly results show why Wall Street has turned so bullish on this business. Its cable segment just posted its largest first-quarter subscriber growth in nine years, while the high-speed Internet division added 400,000 new customers. Better yet, its average revenue per user grew by 4% as more of the subscriber base migrates to high-margin services like its X1 platform. These trends have combined to contribute increasing cash flow to a business that's also helped along by higher spending at Comcast's theme parks. As a result, the overall business is enjoying its highest annual operating cash flow levels yet -- nearly $19 billion -- which bodes well for future dividend hikes given that it currently pays out just one-third of profits in dividends. Scripps Networks, the owner of channels such as HGTV, Food Network, and the Travel Channel, saw its profit double last quarter after it posted its best gain in advertising revenue in five years. Ratings ticked up across all six of its major U.S. networks, leading to a market-thumping 14% jump in revenue. Scripps was the only major media company to achieve consistent growth like that in Q1. On the other hand, distribution fees, which networks charge to distributors like Comcast, rose by a smaller 2%. Management blamed the slowdown on a slight decrease in the broader TV subscriber pool, and that's something investors will want to watch in the coming quarters. Still, the company is executing where it counts, for example by recently turning its Travel Channel business back to growth. In addition to its solid U.S. operations, Scripps is enjoying double-digit gains internationally, thanks to its purchase of Polish TV giant TVN. If the network can continue to resonate with lifestyle viewers at home while expanding abroad, its stock could earn a better premium than the current valuation of just 11 times earnings. TWX Operating Margin (TTM) data by YCharts. 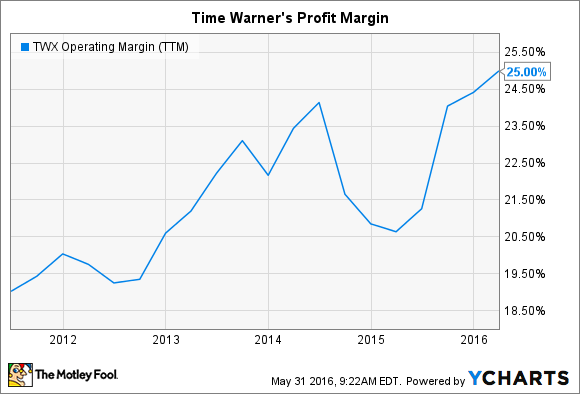 Time Warner's operating margin hit a new high recently as the media giant held the line on programming costs while posting strong gains across its broadcasting, Home Box Office, and Warner Bros. divisions. Turner's CNN doubled its primetime audience thanks to growing interest in the presidential campaign, and that momentum promises to keep lifting results through the year. Programming expense ticked up by just 4%, compared to 10% for Comcast, which allowed TWX's operating income to jump by double digits. Meanwhile, blockbuster hits like HBO's Game of Thrones are helping the company extend its reach outside of the traditional cable TV bundle. HBO Now just launched on two major new platforms -- Xbox One gaming devices and Samsung smart TVs. Investors can expect Time Warner to keep pouring resources into new distribution models like these over the next few years. Time Warner shareholders are used to seeing ups and downs in its varied business divisions. Warner Bros. studios had a particularly bad showing at the box office last year, for example, although its video game hits offset that slump. That shows the appeal of owning a diverse entertainment portfolio and a management team that can squeeze efficiency gains out of every corner of the business.